Want to Work, Travel and Play in Australia? According to the site, "The Working Holiday Program provides opportunities for people between 18 and 30 to holiday in Australia and to supplement their travel funds through incidental employment." The backpacker's Australian work visa allows you to stay in Australia for up to one year; you can leave Australia and return during that time. The visa is intended to allow you to travel around Australia, seeing the sights and enjoying the country while making a few bucks to keep you going - not to embark on a serious job. The logic would appear to be that serious employment would keep you in one place - and the government wants you to enjoy traveling in the country. It's also tough to get a job in professional-level jobs requiring expert experience. 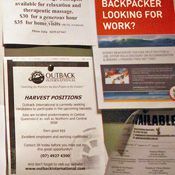 To that end, you can perform casual work (agricultural labor, or toiling on what's called the Harvest Trail, is far and away the most popular with students) for a single employer for up to six months, and then you must move on to another employer. Show evidence that you are enrolled in a "post secondary course of study" or "hold post secondary qualifications"
Which nationalities are eligible for a Working Holiday visa? See the 20 countries participating in the program here. Can I get an Australian work visa as a student?